What an odd bunch The Stranglers were when they emerged into the midst of the Punk Wars back in the mid 1970s. All typical punky snarling attitude and thrashy guitar chords, and yet with a bass player and keyboard man who sounded like Chris Squire and Rick Wakeman at times. What was Down In The Sewer but primitive Prog rock? And what to make of drummer Jet Black – surely he was the rest of the guys' dad? Fast forward to 2017 and the decision by Black (Brian John Duffy on a Sunday) to finally retire from touring now he had reached the venerable age of 78, left The Stranglers with just two members of their classic line-up. Indeed, just a single original member, if one took into account Swede Hans Wärmling's brief tenure with the band, before being replaced by Dave Greenfield in 1975. And yet there was no feeling of being in Tribute Act territory here; new drummer Jim McAuley had actually been filling in for Black from time to time since 2013, whilst the charismatic Baz Warne had been (generally rather successfully, it is felt) attempting to fill Hugh Cornwell's boots since 2000. This jaunt was billed as The Definitive Tour, which struck me as perhaps just a touch presumptuous. 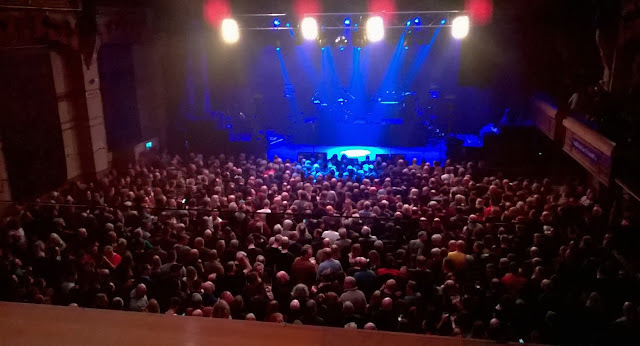 And although there were songs performed this evening drawn from across the band's forty-odd year back catalogue – even a smattering from the post-Cornwell albums – perhaps not surprisingly, the bulk of the set predated 1980. A pair of well known classics opened proceedings before the first newish 'un, 15 Steps, came along. It, somewhat surreally, put me in mind at times of that old cowboy classic Ghost Riders in the Sky. 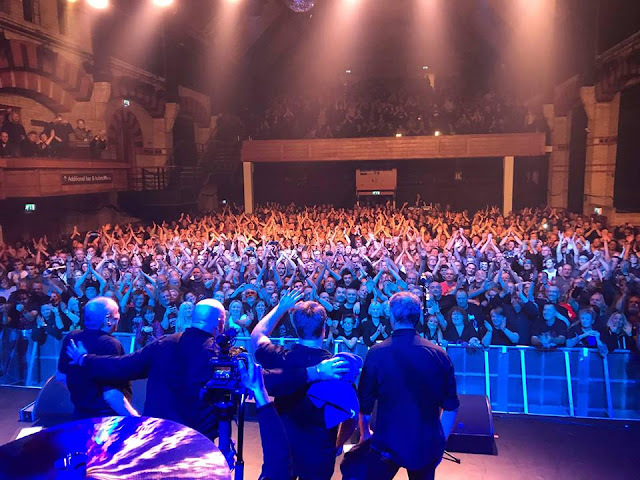 In all we got three from the band's most recent album (Giant, released in 2012), plus a completely new composition entitled Water (this one about the Arab Spring, if I read things right). All were pleasant enough, but hardly earth-shattering. The rockabilly tinged Relentless from their 2006 album Suite XVI, I really enjoyed though. But, of course it was all those 1970s and 1980s tunes most folks had come along to hear performed. Always the Sun took me by surprise a touch. It had generally struck me as a fair-to-middling pop tune from the band's ill-advised New Romantic phase (that video still curls my toes whenever I watch it). But over the years the song had clearly grown into a crowd pleaser, the throng almost raising the roof in the old Corn Exchange bellowing out the chorus. An older one with which I was unfamiliar was Just Like Nothing on Earth, which sounded like The Fall during one of Mark E's less atonal periods. 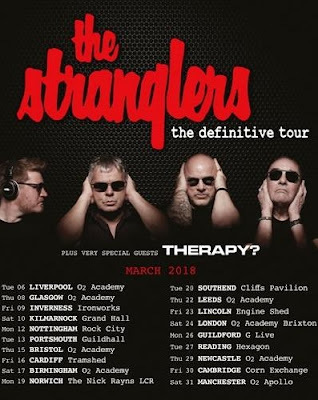 No space this evening, regretfully, for Five Minutes, Skin Deep, Nice 'n' Sleazy or their prog-punk epic Down in the Sewer, each of which would have made my personal “Definitive” Stranglers' tour set. but mainly because I can see me up in the balcony.